The use of Rare Earth Metals continues to rise for hybrid and electric car batteries and other forms of technology. This map shows which states are electric car friendly. September 28, 2013–A gasless car is a good thing for our atmosphere, but, as with other vehicles, they leave a carbon footprint, depending on the power supply of the electrical outlet used for recharging. Comparing the carbon footprint of electric, hybrids, and the gas vehicle can be difficult and complicated, as many factors must be taken into consideration. “An electric car is only as good for the climate as the electricity used to power it,” states a report from Climate Central, an organization of scientists and journalists which reports the facts about our changing climate. In a recent publication Climate Central states that charging the electric car can indirectly burn fossil fuels by using electricity provided by a coal burning power plant. They have published a chart called “A Roadmap to Climate-Friendly Cars: 2013.” The map shows: A) The individual states in which the electric car is climate friendly, B) The states in which driving an electric car is good, but when you include the emissions from producing the car, the gasoline hybrid is more climate-friendly, and, C) The states in which the hybrid car beats the electric car in being the most climate-friendly because of coal burning power plants. You can see which category your state falls in at: climatecentral.org/news/a-roadmap-to-climate-friendly-cars. Climate Central concludes that, “Power plant emissions count against electric cars.” If the electricity source you plug your electric car into is produced by a coal powered plant , then the electric car may not be your best choice, as the power grid varies from state to state, most still using coal. With more than 6.8 million hybrid electric cars on the road worldwide, the batteries of these cars are also controversial, as they use rare earth metals (REEs) in the production, such as terbium, neodymium and dysprosium. Most of these metals are imported from China, raising the risk of replacing the dependency on foreign oil with dependency on rare metals. These metals are not only used by the car industry but are also needed in the manufacturing of fiber optic telecom cables and other technology. 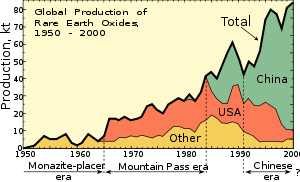 In 2005, China restricted the exports of these metals to limit the environmental damage caused by mining and to ensure that China had enough resources to meet their own domestic demand. Research for alternatives to rare earth metals will continue to gain momentum around the world, driven partly by the scarcity of rare metal. Necessity is the mother of invention, and as the Oxford Dictionary states, “When the need for something becomes imperative, you are forced to find new ways of getting it”—and so it is with electric and hybrid cars. As the metals for the batteries become harder to obtain and the desire to create a more efficient and lower-cost vehicle grows, necessity will create the next generation of cars. Categories: Electric and hybrid vehicles | Tags: Carbon Footprint, Climate Central, Electric and hybrid batteries, Electric car, Electric vehicle, Energy, Honda, Hybrid electric vehicle, Hybrid vehicle, Rare Earth Metals, Toyota | Permalink.